After being greeted at the airport by an AmaWaterways Representative, transfer to Fairlawns Hotel. Note: Please do not schedule your onward flight until after 6:00 p.m. Your journey begins with an overnight stay in Johannesburg. Next, fly to Kasane, Botswana and board the Zambezi Queen, your wildlife river cruise vessel on the Chobe River for the next 4 nights. 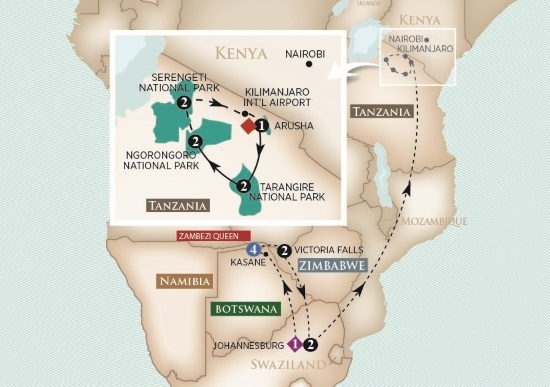 Enjoy two nights at Victoria Falls, one of the Seven Natural Wonders of the World. From here, fly to Johannesburg for two nights at your intimate, all-suite hotel. Depart to Nairobi where a connecting flight brings you to your Tanzania safari. Enjoy two nights at three of the four luxury Tanzanian lodges: Tarangire Treetops, The Manor at Ngorongoro, and the luxury-tented Serengeti Migration Camp or Serengeti Pioneer Camp. Intra-Africa Air: $2,625 per person including taxes and fuel surcharges.